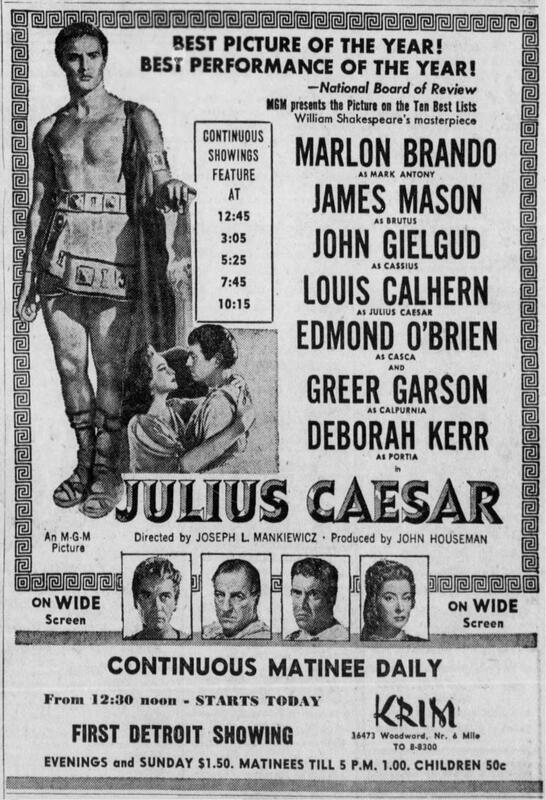 The Michigan Theater’s screening of the 1953 MGM drama Julius Caesar on March 21, 2016 helped me understand that this filmed adaptation of William Shakespeare’s play is more than just a showcase for Marlon Brando. Early in the movie, I fell into the exquisite rhythms of Shakespeare’s gracefully intricate language, thanks to the forcefully nuanced acting of John Gielgud as Cassius and James Mason as Brutus, as they plotted the assassination of the title character. There in the dark, in the musically styled acoustics of the spacious Michigan Theater, I could appreciate language for the sake of language. I’m no Shakespeare expert, and the presentation of Julius Caesar in this setting helped me better understand the accomplishments and appeal of this famous playwright. The Michigan’s showing of Julius Caesar was part of a two-month series titled The Bard: Film Adaptations of the Works of William Shakespeare. Since February 1, this Monday night series has included many cinematic takes on Shakespeare, including Henry V (1944) with Laurence Olivier; a re-imagination of Romeo and Juliet in West Side Story (1961); and next week’s finale, the intense drama Coriolanus (2011). This series is part of a bigger effort to observe the 400th anniversary of Shakespeare’s death. The series is co-sponsored by the University of Michigan Library, which is also hosting a Shakespeare exhibit at the Hatcher Graduate Library until April 27, 2016. Also participating in this observance are Wayne State University, the Detroit Institute of Arts, and the Detroit Public Library. The DIA is exhibiting Shakespeare’s First Folio, a large 1623 book that gathered all of Shakespeare’s plays in one volume, preserving them for future readers. I saw this book on Saturday, March 19, 2016; it was a special thrill to see the original formal publication of the “To be or not to be..” section of Hamlet. Other highlights of the Michigan’s screening of Julius Caesar included the fullness of James Mason’s performance as Brutus, which is the key to understanding this movie. His multi-faceted relationships with Gielgud’s Cassius, Louis Calhern’s Julius Caesar, Brando’s Mark Antony, and Rome itself give much continuity to this drama. Writer/director Joseph L. Mankiewicz skillfully integrated the many acting styles and personalities of a very talented cast. Familiar faces kept popping up, but it didn’t take long for their standard movie image to fade away as their Shakespeare image emerged. Producer John Houseman also integrated many talents in his gathering of cast and crew, including composer Miklós Rózsa, whose stately and rousing score helped sustain the dramatic mood. Houseman also made the crucial and wise decision to film in black and white, which gave the film the texture of a newsreel and also accentuated many details in this precisely plotted drama. Marlon Brando is probably the main reason why people watch this movie both then and now. He received the only acting Oscar nomination for Julius Caesar. Part of the acclaim for Brando’s performance came from the way he confounded the expectations of people who didn’t think he could handle a Shakespeare role after less formal (but equally demanding) roles in A Streetcar Named Desire (1951) and Viva Zapata! (1952). But Brando does bring a quiet strength to his role as Julius Caesar’s close supporter Mark Antony, including a powerfully moving rendition of the famous “Friends, Romans, and countrymen…” speech. Julius Caesar opened in Detroit on February 7, 1954 at the Krim, an art film theater near Six Mile and Woodward. “It will be ‘the thing’ to see it, and it will afford the chance to study this first Shakespearean film out of Hollywood held worthy of comparison with Olivier’s ‘Henry V’ and ‘Hamlet’,” wrote Detroit Free Press Movie Critic Helen Bower on February 7, 1954. Julius Caesar played at the Krim until November 20, 1954, before being replaced by Beauties of the Night with Gina Lollobrigida.